AIMIM reaches out to women voters for Telangana polls. Hyderabad: The AIMIM (All India Majlis-e-Ittehadul Muslimeen) has been organising meetings exclusively for women in various constituencies here for the Assembly elections in Telangana scheduled for December 7. Such meetings have so far been held in the constituencies of Malakpet, Bahadurpura, Tolichowki, Charminar, Yakutpura and Nampally. The next meeting is planned at Chandrayangutta, sources in AMIM said Tuesday. AIMIM president and Lok Sabha member Asaduddin Owaisi has been listening to the grievances of women at the meetings, the sources said. "For the elections, AIMIM is organising women-only events in each constituency. The events allow me and the party candidate to listen to the problems of women voters and work harder for them," Owaisi said. 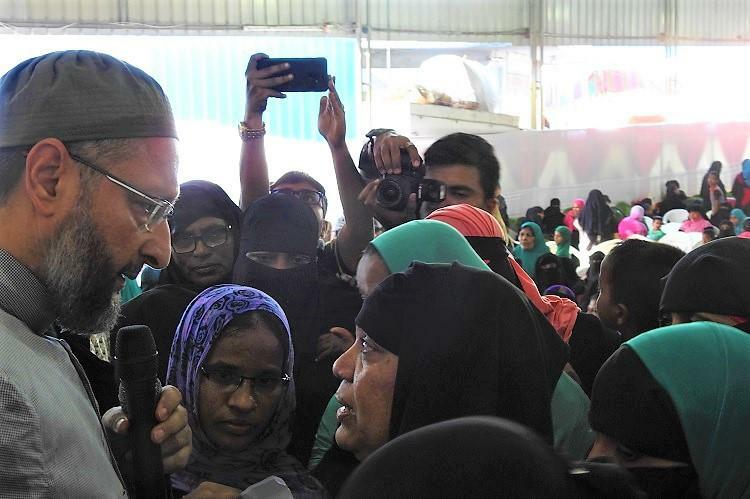 Owaisi, who attended a women's group meeting along with Yakutpura candidate Ahmed Pasha Quadri, had said on November 4 that he would take up work on housing, healthcare and social security more aggressively. Housing, including high rents for rented accommodation, and healthcare are some of the main issues that surfaced in these meetings, the sources said. AIMIM has so far declared candidates for eight Assembly segments in the city. It had seven members in the recently-dissolved Assembly. In August, Congress president Rahul Gandhi had attended an interactive meeting here with the members of women Self-Help Groups (SHGs). In September, BJP leader and Union Minister Smriti Irani had also addressed a women's meeting organised by the party near Medak.